At the Blois conference last week there were plenty of interesting results and updates from experts across the world. The work spanned a whole range of fields from particle physics to cosmology, and I think the most interesting result was the update on the CDF dijet anomaly. It’s worth taking a look at the program for the conference if you want a nice cross section of the status of experiment and theory for various topics. Giovanni Punzi presented a [pdf]talk on the search for the Higgs boson. As we would expect, we see the usual exclusion plots, with LEP at the low mass end, Tevatron making inroads on the region around 165GeV and the LHC starting to close in across the whole range (especially in the WW mode). Of course we’re recording data so rapidly at the moment that the results in this talk are not really representative of our current sensitivity, and the conferences will be playing catch-up for a while! Adding another 3.0fb-1 of data (about 70% more than before) gives an excess of nearly 5σ, and taken on its own has an excess of 2.85σ. Either there is a serious systematic problem at CDF, or this is a new effect! If this indeed new physics, D0 should see something similar, but so far we haven’t heard anything from them. There are efforts at D0 and at LHC to see if we can recreate this peak, so right now all we can do is wait for more results to come in. No doubt you’ll hear about more updates on this blog, so keep reading. There are already quite a few papers on the arXiv about this effect and if you have any more information please leave it in the comments! 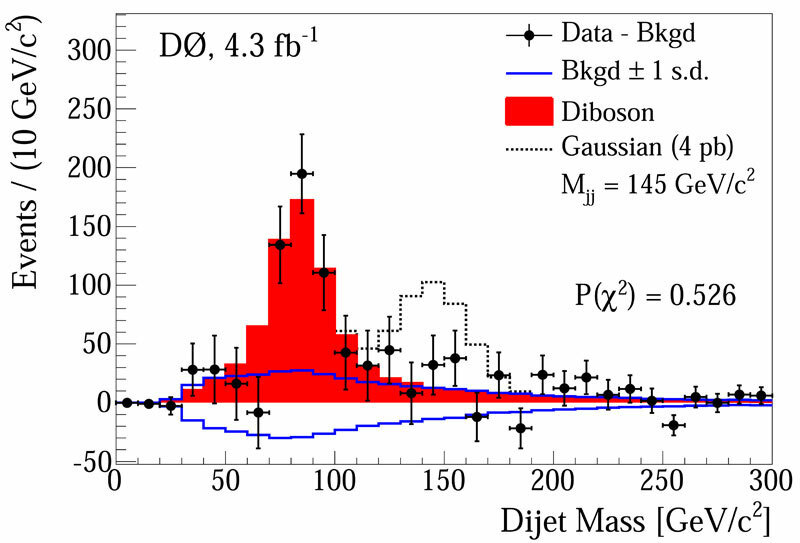 Update: D0 see no evidence of any anomaly in the dijet mass spectrum! Source. D0 result. The black points show the data. The dashed histogram shows the CDF anomaly. The red and blue histograms show expected contributions from the Standard Model.